Welsh Open 2012: Steve Davis The Nugget shocked Ali Carter in the first round match with two tons and through to the last 16 by 4-3. 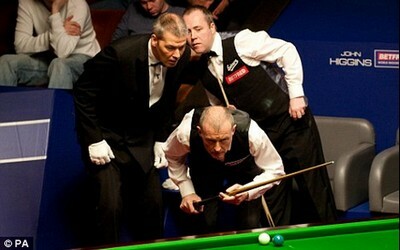 The 54-year-old Nugget won two qualifying matches to get through the final stage of Welsh Open. Davis last reached last 16 of a full ranking event during 2010 World Championship, which he defeated Mark King in first round and then the defending World Champion John Higgins to through to quarter-finals, before losing to eventual winner Neil Robertosn by a wide scoreline. Frames were evenly shared but The Captain is in the lead every time. The six-time World Champion made his first century of the match, 121 in frame 4. Carter got a decent chance to wrap up the match in frame 6 but broken down on 34, which allowed Davis to make a fine 63 to force a decider. The Legend caught his chance and finished the match with stunning 117 to win 4-3. "It's one of my best wins since I beat John Higgins... I don't like it when I lose, but when it goes right it's lovely and I have to enjoy the moment. My aim now is to keep my ranking lower than my age (he's currently No 43) and to see how long I can keep that going." He was looking forward to his meeting against Shaun Murphy in round 2, who sent Mark Joyce home by 4-2 despite throwing the first two frames. "You have to look at every match as, at best, the toss of a coin. I could keep winning or I could go out in the next round." China's Ding Junhui broke Mark Davis's heart again - He beaten Davis with a fine performance to 4-0 in which Davis has only scored nine points in the match. Ding won their last meeting, UK Championship last year in a dramatic way which trashed Mark's hope of gaining a top 16 place at the cut-off point. Ding did the same thing this time, keeping Mark Davis away from top 16 which helped Ronnie O'Sullivan and Stuart Bingham to be seeded in the Crucible. Judd Trump eased Fergal O'Brien 4-0 with 58, 61 and 104. The Defending Champion of the tournament, John Higgins beaten Liang Wenbo by 4-1 to set up a last 16 against Ding. Tom Ford stunned Graeme Dott with a 4-2 victory. The two Welshmen Ryan Day and Dominic Dale both lost their Last 48 matches, Michael Holt will play Stephen Lee while World Number 82 Sam Baird, who won his first ever match at a ranking venue with 67, 72 and 136 total clearance will face World Number 1 Mark Selby in the first round.